Imagine you’re getting ready to go to sleep for the night. that just finished back to back record months. your business is making a difference. October 3rd and October 10th, 2016 are two days that I will not forget anytime soon. On October 3rd, Amazon updated their Prohibited Seller Activities & Actions and their Reviewer Guidelines. This TOS update by Amazon is by far the most disruptive in recent years, and one that they have invested the most planning and follow up in enforcing, and I don’t think they’re even close to done. Since the original announcement, sellers and service providers have scrambled to understand what everything means and what strategies are still within TOS for launching, growing and getting reviews for products. Before I begin, I want to be clear. I have many emails directly from Amazon Legal since October 10th. I will share many of them here in this article and I’ll share some thoughts on how these things affect sellers. However, as with anything related to your business, you should always do your own research and come to your own educated decisions. I sincerely hope it helps. Okay, let’s dig in. We’ll start with the most obvious. You can no longer provide a free or discounted product in exchange for a review. 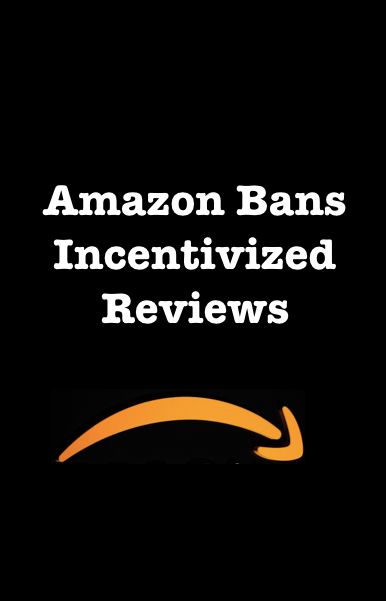 This issue of “incentivized reviews” is the main part of the update on October 3rd with Amazon changing a long standing seller and reviewer policy which previously allowed this behavior. As one of the leading review companies in the marketplace, while we think it could have been rolled out differently, we can certainly understand Amazon’s reasoning. Ultimately, Amazon is a customer-centric business and if the trust between Amazon and their customers erodes even a little, that is a very bad thing for both Amazon and sellers. This email basically became TOS policy a few days later. Regardless of whether a seller is using a 3rd party service provider, running an advertisement, sending to their own email list or reaching out to a reviewer directly, they CAN’T, in any way, provide a product in exchange for a review. It’s the INTENT of the transaction that has changed. You can still create and run a promotion or sale. You can still provide someone a free or discounted copy of your product. You can’t, however, in any way, ask them for a review in advance of that transaction. Here’s the question I asked (in black) and Amazon’s answer (in blue). This answer from Amazon applies to anyone distributing a discount code to any potential customer. The review has to happen organically and naturally. You can’t attempt to incentivize, influence or modify it in any way, ever. Can I ask for a review AFTER a customer receives a free or discounted product? This was my follow-up to the above question. According to Amazon legal, the answer is yes. However, I think this one is a bit tricky. Here’s my question (again in black) and Amazon’s answer (again in blue). The reason I think it’s tricky is because if this happens in large numbers, it’s really going against Amazon’s intent in updating this TOS policy. For example, let’s say you use a company that used to be a 3rd party service provider for reviews in exchange for products, and even though the company doesn’t ask for a review from its members, you get a 70% review rate. Do you really think this is what Amazon wants? Essentially, nothing has changed from before the TOS other than that customer isn’t leaving a disclosure statement. This is not Amazon’s intended outcome. As a seller, you have to stop and think a bit and make smart decisions. This is one of the reasons iLoveToReview has been so methodical and patient in regards to our rebranding and relaunch. At the end of the day we are talking about your seller privileges here. We didn’t want to do anything in haste that would put a client’s account at risk. Just yesterday I was speaking with a client who has a really nice, growing Amazon business. We had a long chat about all of this and I can hear his young daughter playing in the background. I take our relationship to people like this very seriously. Our advice is to tread lightly here. If you are using a previous review company and your campaign yields a ton of reviews, we personally think that could be putting a huge red X on your back. Within our new services under our new brand (more on this later), we have been advising our members not to leave reviews at all. On this one, I think you really need to look at the bigger picture and decide how you want to proceed. What happens if a reviewer leaves the disclosure statement in their review? This one is really interesting because both Amazon and 3rd party providers have been training customers for years to do this in order to be compliant with Amazon’s previous TOS. Here is Amazon’s response. My question is posted first. Personally, I feel this won’t even be relevant after the next month or so as people unlearn what they have been taught. Some customers may do this for a while longer as they honestly may not even know the reviewer guidelines have changed, but it won’t last long. If it happens to you, we don’t believe that it’s likely to result in a termination. We have however heard of a few sellers having their product listing suppressed and then reinstated because of this. As a seller, if you can document what you’ve done and what you’ve done is within the current TOS, then we believe that you should be fine. Again, I don’t think this will be a concern for very long. As entrepreneurs, we’re almost certain to deal with lots of change in our careers. It’s inevitable. How we prepare for and deal with those changes sheds light on our attitude, ability and often our integrity. This has been one of the most interesting months of my professional life. While we shift and adapt to the Amazon marketplace, it’s been really interesting to watch and witness how the industry has responded. Not all 3rd party service providers value your business in the same way you do. Before I begin this section, I want to say that I genuinely believe most companies in the industry truly do want to help people. However, that desire to help people doesn’t always trump the desire for profit…especially during potentially volatile times. On or around October 10th, 2016, most companies you know in the review space received an email from Amazon Legal. Essentially, that email informed these 3rd party review companies and groups that customers and sellers who continued to use their services would have their accounts suspended or terminated. I was on a webinar hosted by CPC Strategy on October 11th and decided to disclose that fact. (Note: not every provider on that webinar had received that email yet and some of those providers may never have received it). At iLoveToReview, we decided to stop all campaigns on October 3rd in order to protect our clients. We also stopped taking any new business until we had more information. While we believed we understood the new update correctly, we weren’t willing to risk our client’s businesses based on our interpretation. Shutting down campaigns for a period of time was the right thing to do. I watched in amazement as other 3rd party providers just carried on. Yes, they made changes quickly. Yes, they worked hard to update their policies to be compliant with the TOS changes, but the whole time they were making those changes they were still taking orders and still running campaigns. It really doesn’t matter if a company was correct in their initial interpretation of the TOS changes. What should matter to you as a seller is how willing they were to risk your business on those interpretations. Maybe I take our responsibility to our clients differently. Maybe I have a different risk profile than they do. I don’t know, but I do know that I would never put profit over doing the right thing. We all have our core values in life that guide us in times of both triumph and tragedy. As entrepreneurs, these core values are super important. They reflect how we treat our customers, our vendors and our partners. Sometimes in business it’s easy to overlook these things because our relationship with a company is mostly transactional in nature. Personally, when at all possible, I like doing business with companies that have values I can align with. In any business, relying too much on any single strategy can be dangerous. For example, if all of your leads in a business are coming from a single source, that could be a problem. If too large a portion of your revenue is coming from a small handful of clients, that could be a problem. With your Amazon business, this could cover two areas. If this TOS update completely freaked you out because doing a review campaign was your only strategy for launching a product, that could be a problem. You really want to grow a knowledge base for yourself that encompasses a number of strategies for growth. How else can you get eyeballs on your listing? How else can you optimize your listing in order to convert more sales out of the visitors you already get? Amazon is a beast. We all know that. The amount of people they attract to their platform is mind blowing. It’s easy to want to just stay on Amazon and never sell your products elsewhere. The truth is, no other platform is going to produce nearly as well as Amazon does. However, if you could add your products to your own website, Shopify, eBay, Jet, Sears, Walmart, Etsy, Newegg or any of the other e-commerce platforms and it increase your income by 20, 30 or 40% while diversifying your risk, it’s likely something you should at least consider doing. Additionally, even just diversifying within the Amazon environment can really grow your income while reducing market volatility. Getting yourself set up on Amazon.co.uk is a great place to start. While Amazon plans to update their TOS in regards to reviews there too, providing free and discounted product in exchange for a review is currently still legal (at least at the time I am writing this). Here is proof of that, again, directly from Amazon Legal (in blue). With less competition and favorable TOS for sellers, selling in the UK is a smart move for many sellers today. iLoveToReview is still fully operational for the UK marketplace. It’s very possible that by adding a few of the European marketplaces, you could see your revenue grow by 40-60% of what you are doing in the U.S with marginal additional work. As you probably know, iLoveToReview no longer provides services for Amazon sellers for the US Marketplace. The owners and staff have already launched the first new company to serve sellers, and the results have been outstanding so far. At this time, that service is only available to our current clients. If you have done business with us before and you want to learn about our new offerings, just reach out to us directly. We expect to be open to new business very soon. If you want to know about the new services, Opt-In Here and we’ll be sure to let you know. I hope this update helps. I know there has been a lot of uncertainty over the last 5 weeks. With a clear head, a fierce determination and a little patience, you can make it through just about anything.